Hiding veggies in your kids food is so last year. What's in? 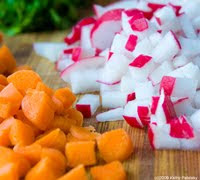 Minimizing your veggies with my Micro Chop Method! Micro Chop Method. I'm not a big fan of hiding veggies in food. However, I have no problem with minimizing them! 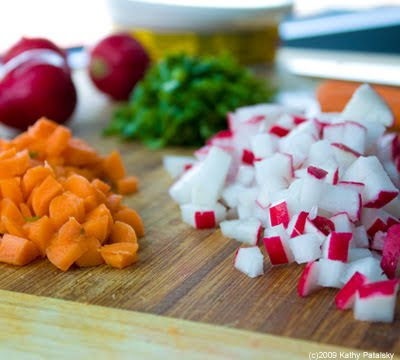 The basic theory: chop your veggies into super small shreds, dices and bits. Tiny bits are easier to eat than big monster sized chunks. I think many adults will even appreciate this idea. 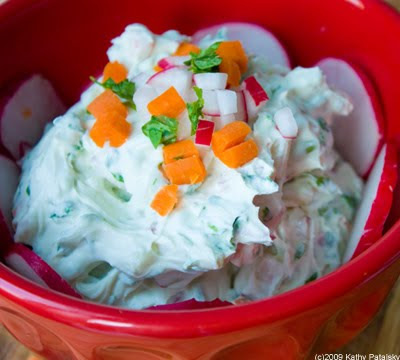 After you've sliced and diced your veggies into the tiniest of bits, fold and whip them into a creamy spread. I love using vegan cream cheese. You can even use this same method in spreads like peanut butter, hummus and guacamole. Healthy Veggie (and Fruit) Options. 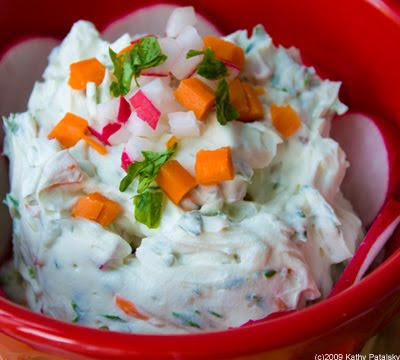 For cream cheese I love a colorful array of radishes, carrots, arugula or parsley. It's crunchy, healthy and zesty! 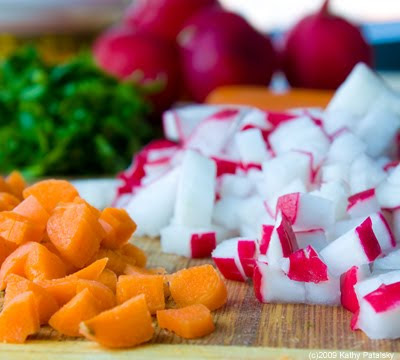 Other healthy veggies (and fruit) that you can easily micro chop include: celery, spinach, bell peppers, apples, raw broccoli, radishes, fennel, olives, scallions, zucchini, cucumber, onions, bean sprouts, mushrooms, parsley, cilantro, basil, cabbage, jicama, and so much more! I just don't advise using anything mushy like tomatoes, strawberries or similar items. 2. 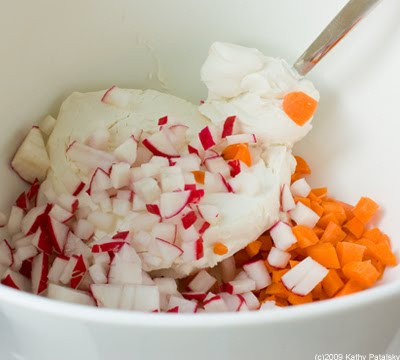 Scoop cream cheese out into a large mixing bowl. 3. 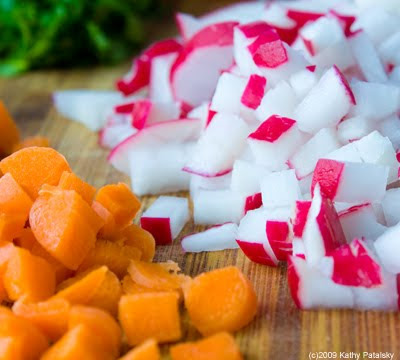 Micro chop your veggies in tiny dices, cubes, shreds and bits. I advise using a Chef's knife or a Santoku knife. I love my Mini Santoku knife from Crate and Barrel-only $10. I found a Mini Santoku Knife from Amazon only $6.99. 4. Scoop all the chopped veggies/fruit into your mixing bowl and whip well. Make sure to coat all the veggies in cream cheese and the manual mixing will whip some nice fluffy texture into the cream cheese. 5. Add some fine black pepper if you'd like. 6. Serve! Add a garnish of leftover micro veggies. Uses: Use it the same way you would any cream cheese. Makes a perfect snack-just add crackers! 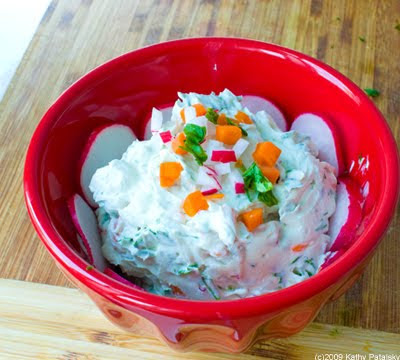 Spread it on bagels, toast, wraps, pitas and even as a veggie stick dip for double the veggies!